It's incredibly easy to make a delicious anchovy sauce at home. All you need is a few common ingredients, a couple cans of anchovies, and a blender or food processor. This no-cook recipe whips up in just minutes and is a tasty addition to a great variety of foods. 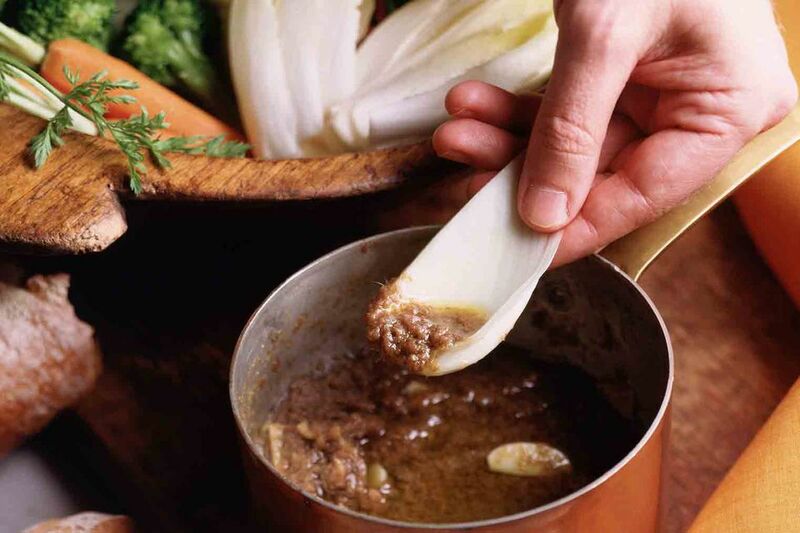 The anchovy sauce here is very similar to anchoïade, which is a popular sauce in Provence, a southern region of France. The primary difference is that the traditional Provençal sauce tends to use white wine vinegar rather than the red variety preferred here. Combine anchovies, garlic, thyme, Dijon mustard, red wine vinegar, and pepper in a blender or food processor. Puree for about 1 minute. With the machine running, add the olive oil in a thin stream and process until the mixture is thick and smooth. The sauce will keep well in the refrigerator for several weeks. Recipe Source: "The Joy of Seafood" by Patrice Boely (Barron's). Reprinted with permission. The sauce will not be as salty or as heavily flavored as the anchovies themselves. However, it does have some noticeable salt and you can reduce this before making the sauce. Soak the anchovies in cold water or milk for at least 15 minutes, or up to an hour, then drain and pat dry. You may also want to reduce the overall amount of salt in your meal. Always keep in mind that a little anchovy goes a long way. The same rule applies to the sauce, so use it sparingly at first and add more if needed. Since it does keep so well, anchovy sauce can become an ingredient in other sauces as well. If you find that your sauce needs a little help, simply add 1/8 teaspoon of anchovy sauce. It will boost the intended sauce's natural flavor but is not enough to alter the taste itself. This is a wonderful trick and it may just be your missing ingredient. What can you do with your new anchovy sauce? There are many ways to enjoy this versatile and simple sauce. Drizzling anchovy sauce over salads—either alone or in addition to other dressings—is among the most common ways to enjoy it. Leafy options like a classic Caesar salad are ideal and it can also work quite well when incorporated into some pasta or potato salads. Another favorite for this sauce is to serve it with hard-boiled eggs. It's also very interesting when tossed with cooked spaghetti or a similar thin pasta. Spice the dish up a bit with some red pepper flake and diced tomatoes. You might also find that you really enjoy anchovy sauce drizzled over steamed or grilled vegetables. It's especially tasty on bell peppers, no matter which color you have. Many people enjoy brushing it onto grilled meats such as chicken and pork, or almost any type of fish. For something lighter, spread it on artisan bread, just as you would tapenade.